“Don’t you worry now,” Mama told Louis. “After some huffin’ and puffin’, Katrina will blow away and land up the coast just like all those other hurricanes.” What no one anticipated, however, is that the hurricane that landed August 29, 2005, would break the levees and alter the landscape—even the language—of New Orleans. By focusing on the experiences of a particular fictional family, Myron Uhlberg renders a moving story built around that event and its chaotic aftermath. The narrator is 10-year-old Louis, named after the legendary jazz trumpeter Louis Armstrong. As the storm rattles his darkened bedroom window, Louis hugs his shiny brass cornet and somehow feels better. At last the rain stopped, but when Daddy opened the door the next day, something worse appeared: water seeped in. With no time for packing or planning, Louis and his parents join others desperate to escape their inundated neighborhood. Louis snatches his precious horn from the coffee table before leaving. Realistic, well-chosen details suffuse the oil paintings by award-winning illustrator Colin Bootman, who also illustrated author Uhlberg’s picture book Dad, Jackie and Me. He situates the family’s simple, well-loved abode in its neighborhood of shotgun houses of many hues, lived in by people of various races, but mostly by other African Americans. He captures the folks’ worried expressions and especially the family’s care for each other as they venture through flooded streets, holding hands. By employing a striking palette of deep marine blues and mutable shades of turquoise, Mr. Bootman immerses readers in a watery world where normalcy disappears. Can a porch become a boat? Can streets become rivers? Can a neighborhood disappear in one day? Such is the stuff of nightmares or Alice-in-Wonderland fantasies—or of the real world that families such as Louis’s encountered that day. Brightness occasionally pierces the illustrator’s dark images: the glint of Louis’s cornet, a dazzling, blue sky; an artificial Christmas tree drifting by, ornaments still attached; and most troubling to Louis, a lost dog with a red ball. Mama, Daddy, and Louis keep floating on a piece of someone’s torn-off porch, unable to care for the pup. As the waters rise, so does the tension. Louis grabs a broom to help steer their “lifeboat.” Who wouldn’t wonder what might lie beneath those murky waters? The author hints at the existence of dead bodies in the water, as Louis’s broom hits a pile of clothes. Mama quickly covers his eyes and tells him not to look. The family’s tortuous journey takes them to the higher ground of the Superdome, where multitudes of people are crowding the gates. The bewildering bigness of the Dome, its white roof punctured by storm winds, comes across in Mr. Bootman’s painting of the family surveying the football field from their perch in the distant stands. In a story filled with irony, the family’s predicament seems even darker in the stadium that when floating on the bit of porch. Yet, Mr. Uhlberg does not offer us a story of helpless victims. Children will thrill to the quick thinking of Louis, who comes up with the perfect solution when Daddy loses sight of the family. And, interestingly, thanks to Mama’s decisiveness, the family eschews the yellow schoolbuses that finally arrive to take the stranded elsewhere. The author and illustrator beautifully balance this troubling tale with just the right amount of optimism. Even the dog with the red ball has reason to yelp with joy, as it gets to join Louis and his parents on their way back home. Adults will no doubt notice the vague, muted horizon confronting the family and will wonder how they will cope with the obstacles ahead. The simple answer evoked by Mr. Bootman’s concluding image is this: by putting one foot in front of the other. The somber facts of the flooding that killed 1,800 people show up in the author’s note, along with three photographs relevant to the picture book. The author’s suggestions for additional books and websites will prove helpful for young researchers. 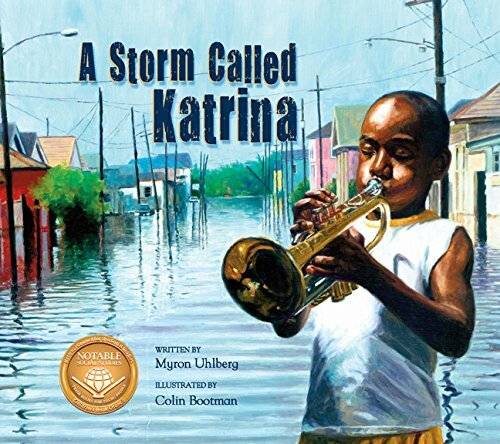 A portion of the proceeds from sales of A Storm Called Katrina will be donated to the Norman Mayer Library, which is being rebuilt in the Ninth Ward neighborhood of Gentilly, New Orleans, the setting for this story.